Asynchrous programming techniques provide a way to improve a program's responsiveness. 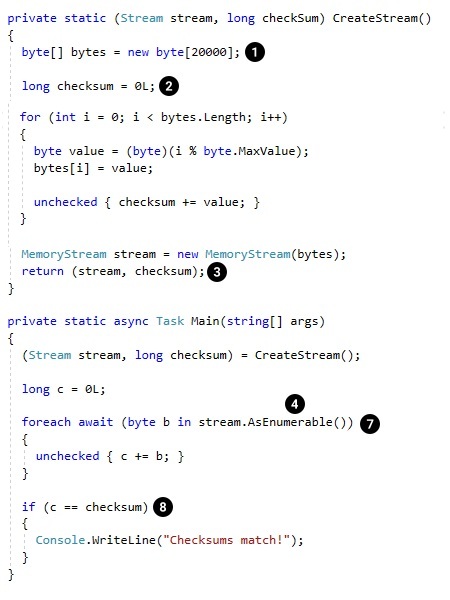 Async/Await pattern debuted in C# 5, but is limited to returning a single scalar value. C# 8 adds Async Streams, which allows an async method to return multiple values broadening its usability. Async streams provide an excellent way to represent asynchronous data sources that can be controlled by the data's consumer. 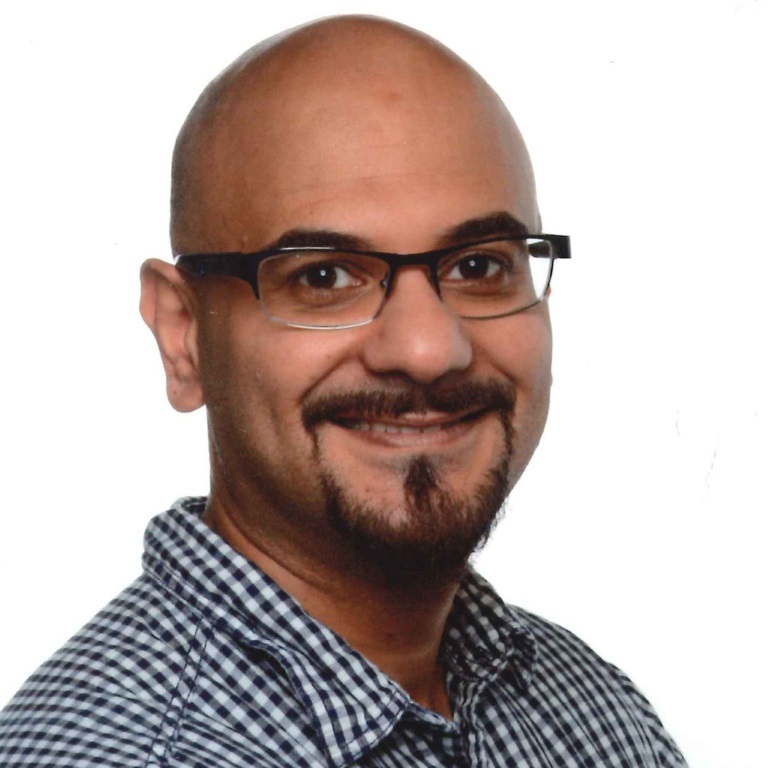 Async/Await is introduced with C# 5 to improve user interface responsiveness and web access to the resources. In other words, Async Methods help the developers to execute asynchronous operations that do not block threads and return one scalar result. After many tries by Microsoft to simplify asynchronous operations, the async/await pattern has gained a good acceptance among developers thanks to its easy-to-understand approach. One of the significant limitations of the existing async methods is the requirement that they must have a scalar return result (one value). Let us consider the following method async Task < int > DoAnythingAsync(). The result of DoAnythingAsync is an integer (One value). Because of this limitation, you cannot use this feature with yield keyword, and you cannot use it with the async IEnumerable < int > (which returns an async enumeration). If it were to be possible to combine async/awaiting feature with a yielding operator that will allow us to use a very powerful programming model which is known as asynchronous data pull or also known as pull based enumeration and in F# this is called async sequence. The new proposed feature Async Streams in C# 8 remove the scalar result limitation and allows the async method to returns multiple results. This changes will make the async pattern more flexible so that you can retrieve data in lazy asynchronous sequence from the database or you can download data from in an asynchronous sequence that returns the data in chunks when they become available. Usually, in the Push Programming Model, you do not have to control the Publisher. The data are asynchronously pushed into a queue, and the Consumers consume the data when the data arrives. Unlike the Rx, the Async Streams can be called on demand to generate multiple values until the end of the enumeration is reached. In this article, I will compare the pull-based model with the push-based model, and I will show you in which scenario which technique is a better fit from the other one. I will use many examples and coding demo to show you the whole concept and the benefits, and finally, I will discuss the Async Streams feature and show you a demo code. My example is about the Producer/Consumer famous food example, but in our scenarios, the Producer will not generate food, instead of that he generates data, and the Consumer consumes the generated data as shown in Figure -1-. The Pull Model is easy to understand. The Consumer is asking and pulling the data from the Producer. The other approach is the Push Model. The Producer publishes the data in a queue, and the Consumer must subscribe to receive the desired data. 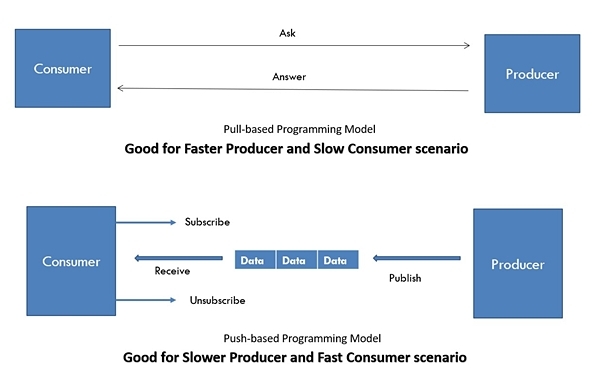 In the "faster Producer and slow Consumer" use case, the pull model is suitable because the Consumer pulls its required data from the Producer to avoid the overflow issues. In the "slower Producer and faster Consumer" use case, the Push Model is suitable because the Producer pushes more data from the Producer to Consumer to avoid causing the Consumer unnecessary waiting time. Rx and Akka Streams (Stream Programming Model) use the Backpressure technique, which is a flow control mechanism. It uses the Pull or Push Models to solve the Producer/Consumer problems mentioned above. In my example below I have used a slow Consumer to pull asynchronous sequence of data from a faster Producer. Once the Consumer processes an element, it will again ask the Producer for the next element, and so on until the end of the sequence is reached. 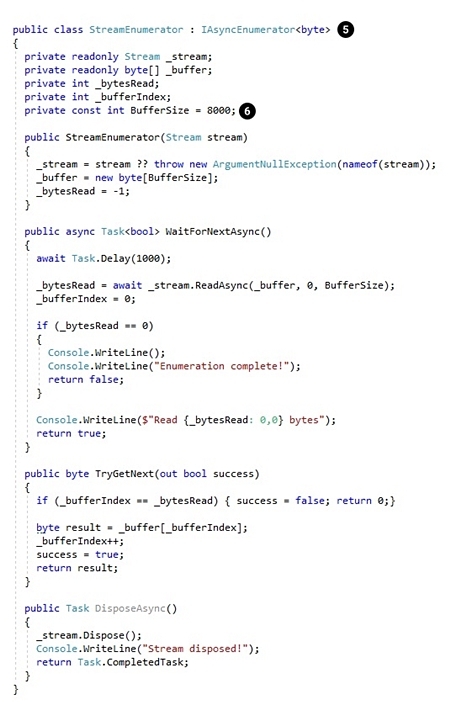 To understand the problem why we need Async Streams, let’s consider the following code. We can make this method lazy by using the yield operator as shown below. As you see above in the output window, the result is returned in parts and not as one value. The above shown accumulated results known as lazy enumeration. However, we still have a problem; the sum methods are blocking the code. If you look at the threads, then you can see that everything is running in the main thread. Now let’s use the magic word async and apply it to the first method SumFromOneToCount (without yield). 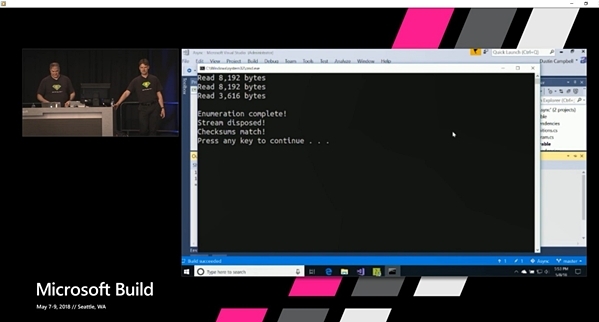 // Sum runs asynchronously! Not enough. We need sum to be async with lazy behavior. Nice, we can see that the computing is running in another thread, but we still have a problem with the result. The result is returned as one value! Imagine that we can combine the lazy enumerations (yield return) with the async methods in an imperative style. This combination known as Async Streams. It is the new proposed feature in C# 8. The new feature gives us an excellent technique to solve the Pull Programming Model problems like downloading data from a website or to read in records from a file or a database in a modern way. When we are trying to add the async to the SumFromOneToCountYield, then we get an error directly as shown above! // !! !This is not what we need we become the result in one block!!!! As you see in the threads, we calculate everything asynchronously, but we still have a problem. The results (all results are accumulated in the collection) returns as one block. That is not our desired lazy behavior. If you remember, our goal was combining the lazy behavior with asynchronous computing style. To achieve the desired behavior you need to use an external library like Ix (part of Rx), or you have to use the new proposed C# feature Async Streams. Back to our code example. I have used an external library to show the async behavior. // Start a new task. Used to produce async sequence of data! // Start another task; Used to consume the async data sequence! // Just for demo! Wait until the task is finished! Finally, we have achieved our desired behavior! We can iterate asynchronous over the enumeration. I will show the concept in a more realistic example. Client/Server Architecture is an excellent scenario to demonstrate the benefits of this feature. 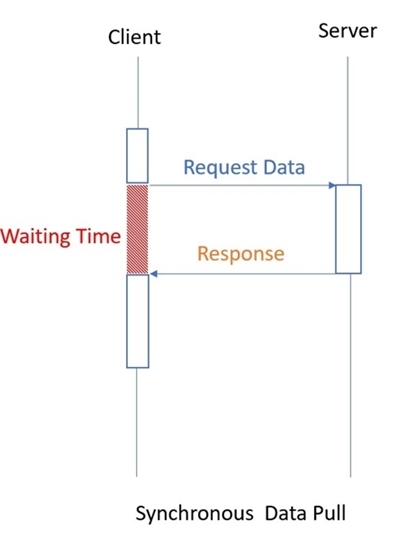 The Client sends a request to the Server, and the client must wait (The Client is blocked) until the response is coming from the Server as shown below in the Figure -3-. In this case, the Client asking for the data and continue further by doing something else. Once the data is arrived then the client continue with his work. In this case, the Client asking for a chunk of data and continue further by doing something else. Once the data chunk arrives. The Client process the received data and asking for the next data chunk and so on until the last data chunk. This scenario is exactly where the Async Streams idea is coming from. The Figure -5- shows that the Client can do something else or process the data chunk when any data is received. 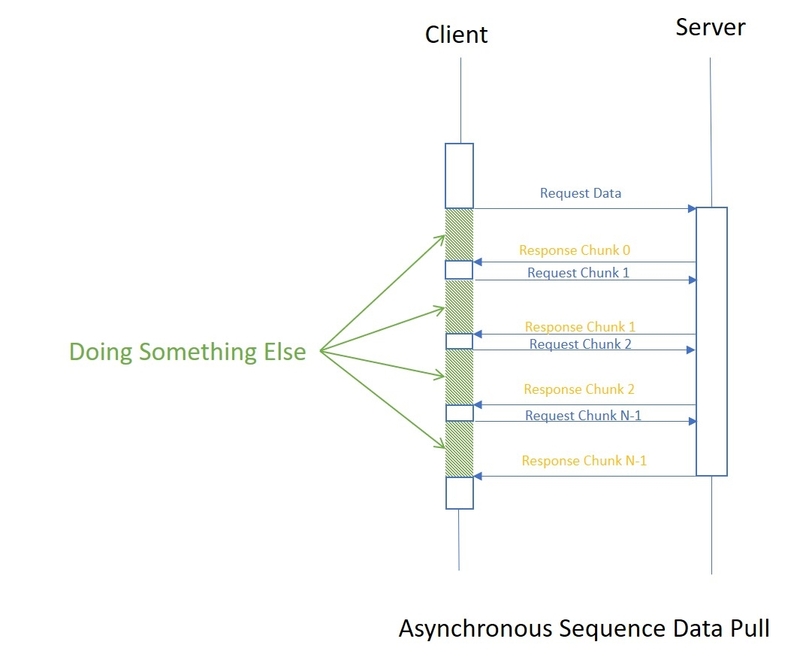 Figure -5- Asynchronous Sequence Data Pull (Async Streams). The Client is not blocked! Jonathan Allen has handled this theme in InfoQ. I do not want to repeat everything again here, so I recommend you to read his article, too. The trick in the Task<bool> MoveNextAsync() reutrn value (changed from bool to Task<bool>, bool IEnumerator.MoveNext() ). This trick will help to keep the whole computation asynchronous and its iteration asynchronous as well. The consumer decides that it is ready to await the next value. Mostly, it is still a pull model even though it is asynchronous. An IAsyncDisposable interface can be used to enable asynchronous cleanup. Further information about async you can find here. // Working the yield dataChunk! Or doing something else! As seen above in the example, instead of computing a single value we can now to potentially compute many values, sequentially, while also being able to await other asynchronous operations. I have rewritten the Microsoft Code demo; you can download the whole code from my GitHub. The idea behind this example is to create a big MemoryStream (array 20000 bytes) and iterate asynchronously in sequence over the elements of the collection or the memory stream in our scenario. Each iteration pulls 8K from the array. At the Point (1) we are creating a big byte array and filled with some dummy values, and at Point (2) we have defined a variable, which called checksum. We will use the checksum to ensure that the sum of the calculation is correct. The array and the checksum are created in memory, and both returned in a tuple as shown in the Point (3). Point (4) AsEnumarble (better name AsAsyncEnumarble) is an extension method which it helps to simulate the async stream in 8 kb blocks (BufferSize = 8000 Point (6)). Usually, you do not have to inherit from the IAsyncEnumerable, but in the above-shown example, Microsoft did that to simplify the demo as shown below in Point (5). Point (7) is the "foreach", which pulls the data in 8 kb chunks from the async memory stream. The pulling process is sequentially when the Consumer (foreach code block) is ready to receive more data; then he pulls more data from the Producer (memory stream array). Finally, when the iteration is finished then, the application will compare the 'c' with the checksum and write "Checksums match! ", if they are matched as shown in Point (8)! We have discussed Async Streams, which is an excellent asynchronous pulling technique that can be used to write computations that generate multiple values asynchronously. 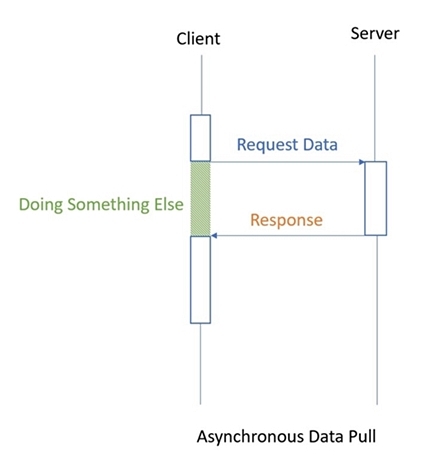 The programming concept behind Async Streams is the async pull model. We can demand the next element of the sequence, and we eventually get a reply. This is different to the push model of IObservable<T>, which generates values unrelatedly of the consumer’s state. Async Streams provide an excellent way to represent asynchronous data sources that can be controlled by the consumer, for example, when the consumer isn't ready to handle more data. Examples include a web application or reading records from the database. I have demonstrated how to produce an async enumeration and consuming it with an external async sequence library. Also, I have demonstrated the concept of how this feature can be advantageous to download stuff from the web. Finally, we have seen the new Async Streams syntax, and a complete example, which is based on the Microsoft Build Demo Code (May 7-9, 2018// Seattle, WA). I understand the need for IAsyncEnumerable but awaiting a foreach doesn't seem like a big deal. I can just as easily do that with a while loop awaiting each iteration manually. Maybe it is nice to have but certainly not some major improvement. I am not sure I fully understand the article but it seems like what I am missing is the equivalent of yield. The final example includes manually implemented AsyncEnumerator and the great thing about the iterators language feature is that it greatly simplifies writing those. Also I thought sticking a Dispose on an IEnumerable is considered a mistake. Why are they doing it again with the Async version? Right now using IEnumerable with async is incredibly expensive in terms of the number of objects that are generated. And you can't inline functions across await calls. With the IAsyncEnumerable interface you have two loops. The inner loop that looks like a normal IEnumerable with all the performance that entails. Only when you actually run out of data do you move to the outer loop and make an await call. If the data happens to be coming in faster than you can process it, you may never hit an await. But even if you do, you won't be wasting anywhere near as much time on garbage collection and context changes. P.S. I'm the author of the library. Yes, I agree with Sergeii and I also recommended currently to used it! github.com/Dasync/AsyncEnumerable ---> Just try it when you need a good soultion for the async pull based problems.